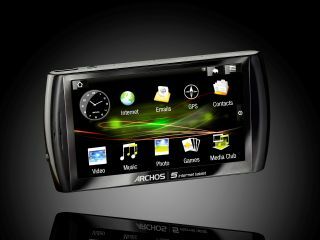 Archos has finally launched the new 5 Internet Tablet, running on a skinned version of the Android OS. The new device comes in a range of capacities, with flash-based memory (8GB to 64GB) and a hard drive memory (160GB and 500GB) both on offer. The screen is a 4.8-inch effort with widescreen VGA display (800 x 480), and features HD output to 720p for use on a TV. The Archos 5 Internet Tablet sadly doesn't have 3G support on board like most were expecting, instead providing Bluetooth tethering to a mobile phone to use as a modem. Most were expecting Android-based devices to turn up with a 3G connection, and this may harm the new device's chance of success in the market initially. The Archos 5 Internet Tablet doesn't have access to the full range of Android applications, thanks to not being eligible for Google's official certification (TechRadar was told this was due to it not having a compass and a camera) so it has had to design its own application portal instead (the Apps Lib, which we brought you information on earlier). There's also a GPS chip included, with full 3D mapping software too for navigation. This is provided by Blom, and the devices offer a 7 day trial of the software out the box. Prices range dramatically depending on the capacity on offer, with the 8GB costing £200, the 32GB £275, and the 64GB coming in at £370. All these also feature a microSD expansion slot to allow more memory to be plugged in too. It gets a little cheaper for HDD memory, with the 160GB effort priced at £300 and the 500GB only £50 more at £350, so it's likely most will plump for the latter. And while the flash based 5 Internet Tablets aren't too bad in the hand (at 143.2x78.8x10.4 mm and 182g) the HDD options are a little on the large side (143.2x78.8x20 mm and 286g), which might be a little chunky for some. Archos has again decided to offer add ons as plug ins to the device, but this time only limited it to the HD option, to output to TV in full HD, which comes for free when purchasing the optional dock. The new Internet Tablet has been given a UK release date for later this month, from Amazon and Archos' own website.